Gardeners across the United States are harvesting big bucks from remarkably tiny plots. When I was a suburban farmer in Knoxville, Tennesse my partner and I grew nursery stock on a 60-foot by 200-foot lot. In one season we sold over $14,000 worth of plants. 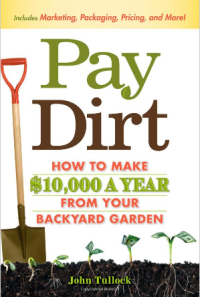 Packed full of gardening, marketing, and selling tips and tricks, this book shows you how to develop your own small plots of land (less than an acre) into a money-making resource. A good garden is full of greenbacks! What Vegetable Crops Should I Grow? Gardeners across the United States are harvesting big bucks from remarkably tiny plots. When I was a suburban farmer in Knoxville, Tennesse (population about 250,000), my partner and I grew nursery stock on a 60-foot by 200-foot lot, and we still had plenty of room for a kitchen garden. In one season we sold over $14,000 worth of plants. Reader Cindy says, "As more people turn to locally grown food and want sources of organic produce, the home gardener can turn a hobby into profit. This book isn't a handbook that covers every detail of starting a micro-farm but it is a great starting place for anyone entertaining the idea of growing extra food to sell at a local farmer's market, from a roadside stand, or to local restaurants who want fresh, local, organic produce. "While the emphasis is on gardening, the book also includes information on developing good soil, raising livestock, cultivating honey bees, and alternative produce such as flowers. The author gives advice from his own expertise on the financial side of micro-farming, marketing and selling strategies, plant-by-plant information, and how one can turn less than an acre into a source of income. "For anyone wanting ideas for selling extra produce from the garden or who may be entertaining the idea of going fully into business, this book is a good source of information."